Automotive HMI Technologies is the technology in which driver can have communication with the automobile without disturbance while driving the vehicle. Human machine interface is used to convert the data into useful facts. Some of the key features of HMI technologies are speech recognition, customization etc. The added advantage of using HMI is that it connects the driver to outside world and gives the important information such as weather updates, traffic condition etc. The HMI technology is continuously evolving and is used in both expensive and low cost machines. HMI technology is relatively advanced technology which is used in Automobile in order to improve the performance and increase the safety of the people. The CAGR of global automotive HMI technologies is expected to be around 13.5% during the year 2018-2027.It is anticipated that global automotive HMI technologies market be valued at USD 30 Bn by 2027. The Automotive HMI technologies market is segmented on the basis of product type, technology, access type and vehicle type. On the basis of product type global automotive HMI technologies is segmented into voice control, central display, Instrument cluster and head up display. The head-up display (HUD) segment is projected to be the fastest growing segment during the forecast period. On the basis of technology, it is segmented into visual, acoustic haptic and mechanical. The visual HMI technology is expected to dominate in the future on the account of high application in automotive industry. High demand from automotive industry on the account of increasing need for safety and security is driving the market growth of automotive HMI technologies. It offers variety of ways to communicate such as touch screen, voice recognition etc., which help the driver to understand the complicated situations and enhances the driving capabilities making it safe for driver to drive without distractions. The technology Advanced driver assistance system (ADAS) uses automatic brake and lane assist is gaining traction in automotive industry. Rapid urbanization , high disposable income and growing population are key drivers for Automotive HMI technology. 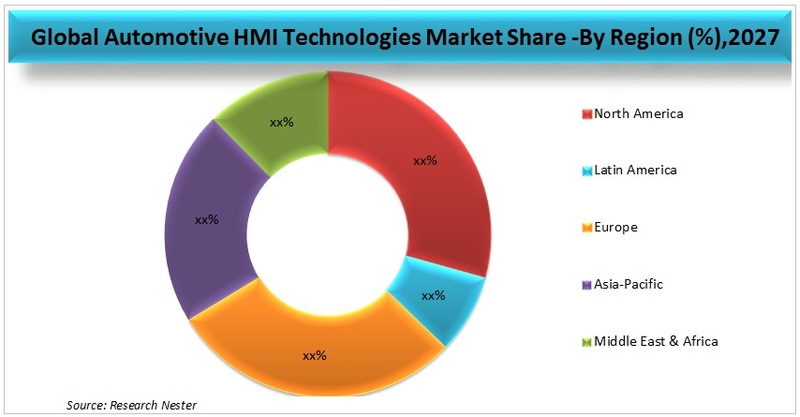 Companies operating in the HMI technologies market are continuously investing in R&D activities in order to offer advanced technology with differentiated features. Moreover, companies are adopting various strategies in order to expand its foothold across the globe.